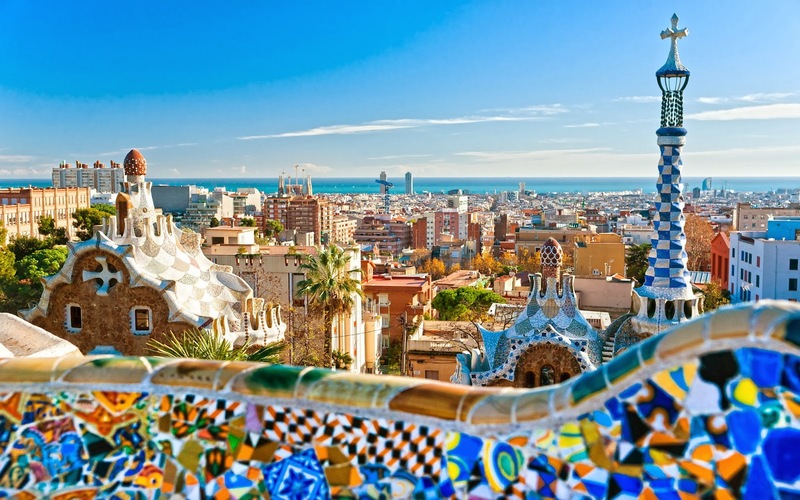 We have a 4-day weekend coming up so we're packing up and flying to the warm and sunny Barcelona! What's on the MUST DO/MUST SEE/MUST EAT list? Friday can't come soon enough! Yay! Somewhere I can actually suggest places to go! I went on a mission trip with my church to Barcelona in 2004. Definitely Park Guell and La Sagrada Familia. We took a bus tour of the city and one of my very favorite stops on the tour was Poble Espanyol de Montjuic (known as the Spanish Village). And you must walk up and down Las Ramblas (I believe it is the longest street - definitely the most famous) and go all the way to the end where you will find the beach. If you go to Parc Guell first, you can walk (downhill) to Sagrada Familia, stopping along the way for a snack at an authentic tapas bar. From there you can reach many key sights within 15 minutes on foot: Las Ramblas, Parc de la Ciutadella, the cathedral and other churches and lots of eating and shopping places. If the kids don't want traditional Spanish food, and you want to be slightly more authentic than McDonalds, there's a great fast food chain called 'Viena' which does hotdogs, chips/fries (I'm English, so they're chips to me!) & 'bikinis' (which are cheese & ham toasted sandwiches. Again, my daughter, who is a slightly picky eater, thought this was fab. You have to have chocolate con churros in a cafe somewhere. Until you've tried it in Spain, you have no idea! Its a very thick, hot chocolate sauce & it's divine! We didn't go in, but all the Gaudi buildings, like Casa Batllo, are fantastic even if you just walk past them & look from the outside. Go to the Mercat de Sant Josep de la Boqueria food market (its off the Rambla) - it's a riot of colour & smells - great for photos, and you & the kids can try all the lovely fruit juice/smoothies that they sell on almost every stall in a great variety of flavours. I hope you have a wonderful time - we loved it so much we're back for round 2 this summer - next time you go the Costa Brava is very close and beautiful, though that's probably better saved for the summer. Gah, SO jealous! Never been so I have no recommendations but have so much fun and take lots and lots of pictures!!!! Definitely the rec's mentioned above like Parc Guell and La Sagrada Familia. The Impossible Project store for some photos and good camera inspiration. Oh it's one of our favorite cities ever - hope you think so too! !